I am so excited to introduce you to Sparklers, my newest pattern! I've been waiting impatiently to share this one. :) I'm the August Guest Designer for the Patchwork Posse Quilt Group, where it's exclusively available. When Becky approached me about becoming a guest designer, I was honored and thrilled. I set out to create a pattern that allows improvisation beginners to experiment. I explain step-by-step how to make sparklers using scraps (this project is so strip scrap friendly, it's ridiculous - is that a phrase, by the way? Strip scrap? Well, it is now). The design itself has been lurking around my sketchbook for a couple of years, and it seemed perfect for a table runner. You could make it into a quilt easily (piece rows of them together), and any three colors will do. And that's right, I mentioned improv - all the sparklers are slightly different! I quilted the table runner with the design in mind. 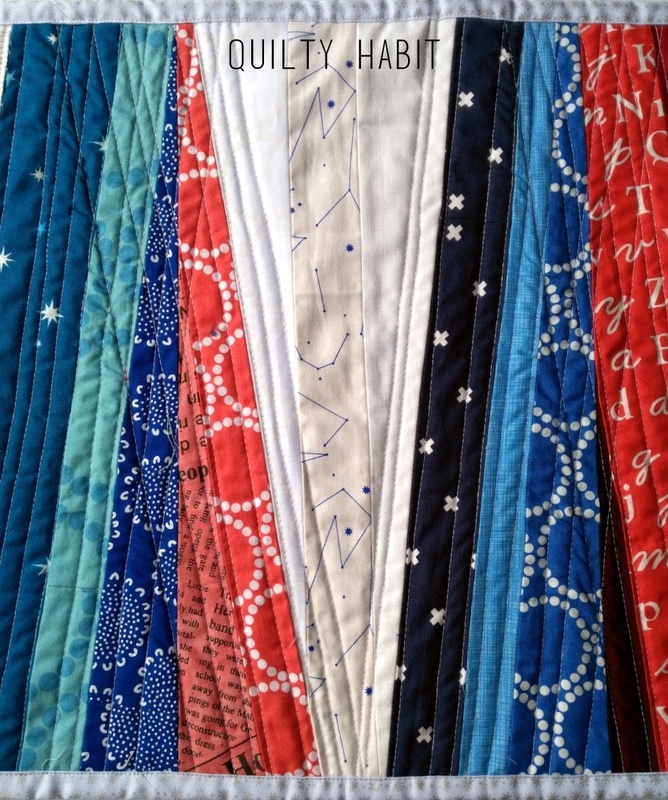 I imagined sparklers on the Fourth of July exploding outwards, so the quilting lines inevitably crossed. 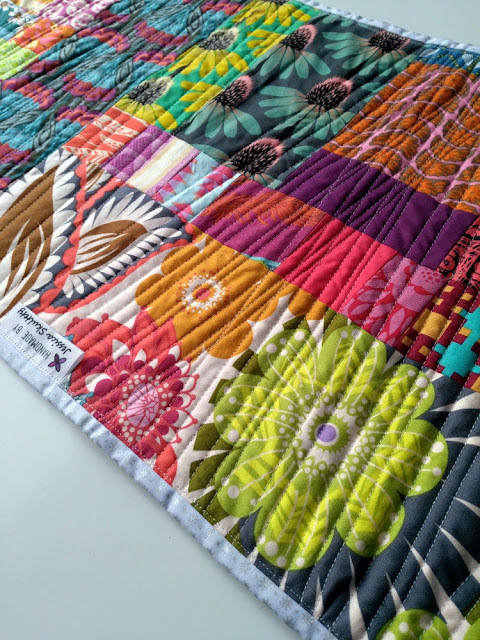 It's a unique and easy way to change up your straight line quilting and try something new! I used Aurifil #2600 Dove Gray - which is a phrase I feel like I repeat here constantly - because it will ALWAYS be my favorite gray thread. It's not bright like white, but it's not so dark that it busies the fabric. By the way, the patriotic side of the runner (if you're American and you make it this way) can be used several times a year, including but not limited to: Memorial Day, Labor Day, Independence Day/Fourth of July, Flag Day, and the Olympics. 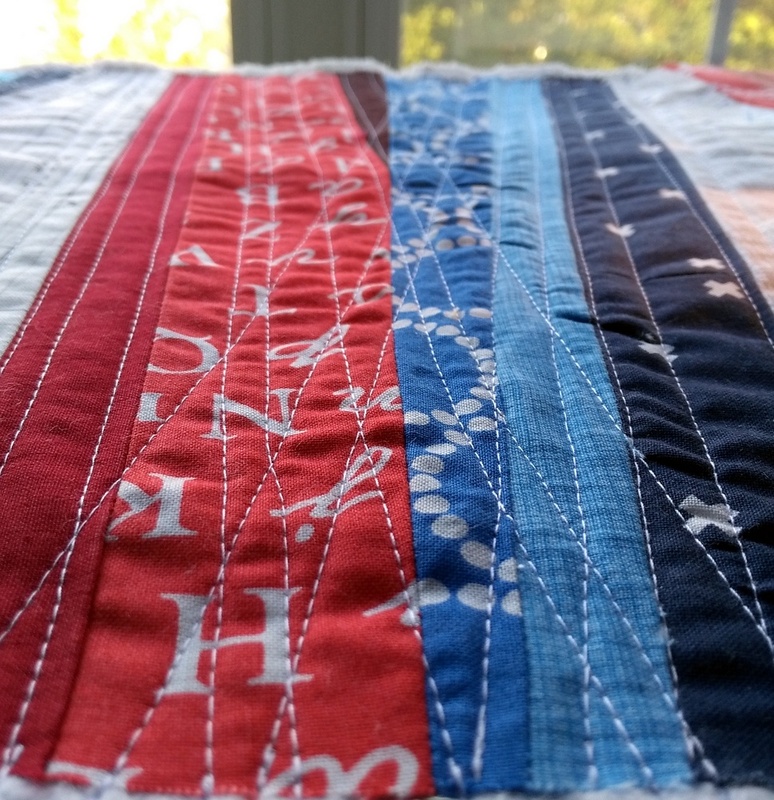 Plus, it's a modern, slightly quirky design - quite different than what you typically see in patriotic decor (and patriotic quilts, for that matter). As I mentioned previously, though, ANY colors would look great in this layout! I'd love to see one made in all solids (any takers?). If you'd like to get the pattern, you can access it as a member of the Patchwork Posse Quilt Group, which meets online instead of in-person. You pay annual dues just like an in-person guild, but you can interact with members all over the world (there's a private Facebook group and forums). 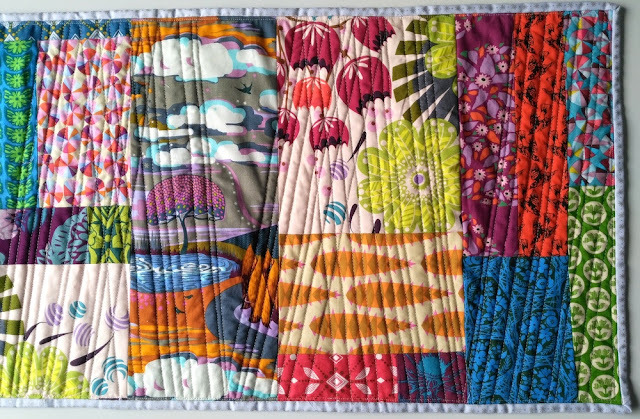 The guild also has a Block of the Month (BOM), Mini Quilt BOM, patterns from guest designers (like this one), and much more. Becky runs a tight ship, let me tell you - there's always something going on! If you want more info and/or want to join, click here. Now, I know you're wondering about the back. 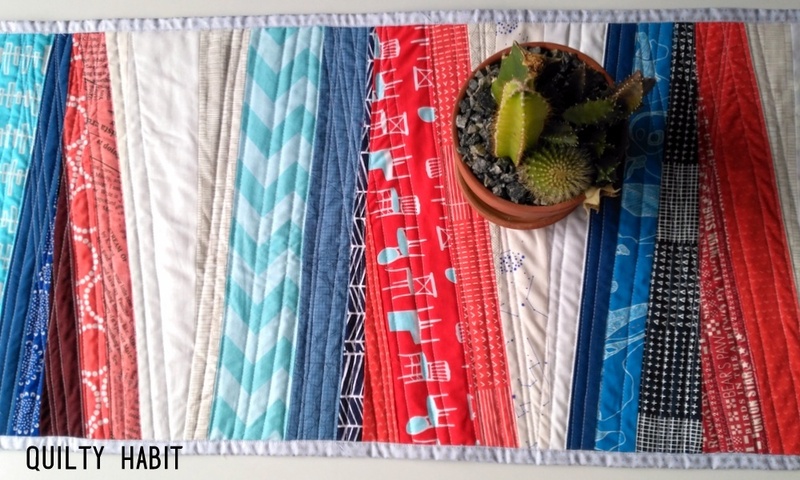 I almost always make table runners double-sided so they can be used for more than one purpose. 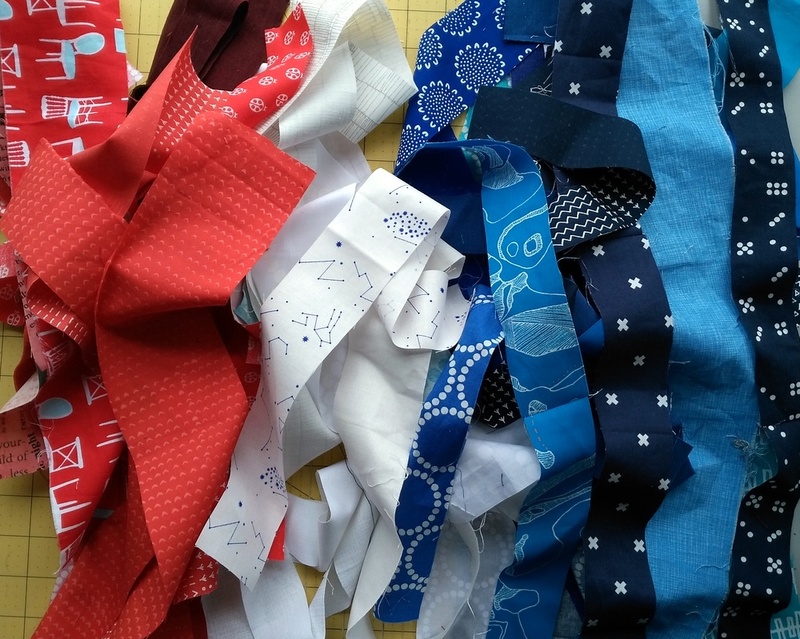 One day, I had the urge to piece together some of my precious Anna Maria Horner fabric scraps (they are so precious, in fact, that they live in a special bin). 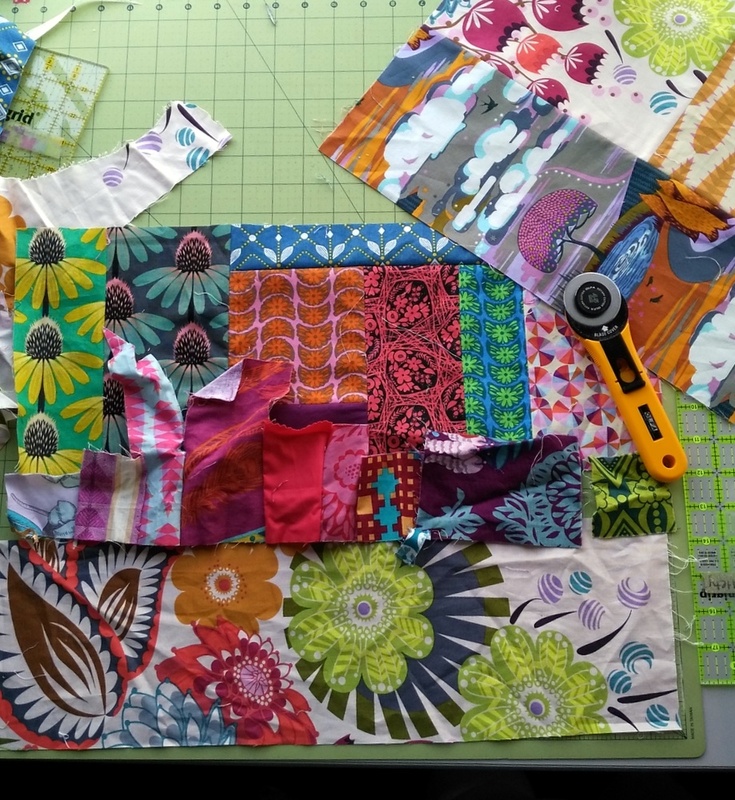 I spaced out several pieces of that tulip-like print below (Summer Totem in Grape from Loulouthi) throughout, and built the runner around it (it's my FAVORITE PRINT OF ALL TIME in the history of fabric - and I only have scraps left!). I bound the quilt in the pale blue, sparkly Asterisk print from Lizzy House's new Whisper line (it complemented back and front well - and binding is often my struggle with double-sided table runners. It has to be just right!). I have to give a quick shout out to my mom, who is currently using this runner. She picks the most beautiful flowers from her garden, which end up gracing the tabletop, too! 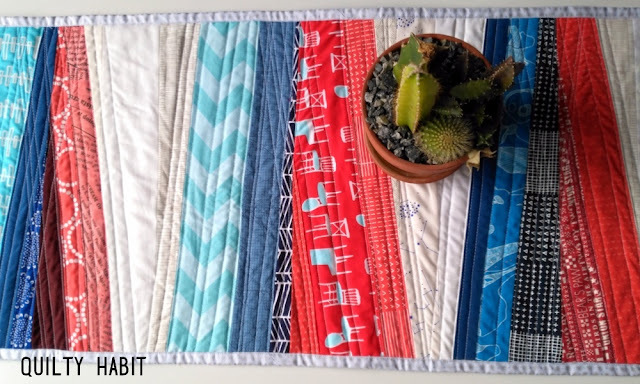 So, do you feel like you need to make a table runner? I'm getting the itch, too (again - but maybe it never went away). Don't forget to check out my interview and podcast over on the blog while you're sewing! And THANK YOU, as always, for your support. Woo hoo for your new pattern! I appreciate many things about this post, but the idea that resonated the most with me is how you've been sitting on this design for a few years. Too often I think that I have to jump on an idea right away, but there's something to be said for letting it simmer. After a while a I-might-want-to-make-this project becomes a I-have-to-explore-this-now project! I love this! I can see it in all kinds of prints and solids! Table runners are fun to make because they are usually pretty fast! Well done! My AMH has it's own special bin too! I like both sides, but the back especially gets me. I love its crazy disorder! Great quilting. What a fun tablerunner! I love it. Great finish! I need to remember your tip about making them double sided and multi purpose. Thanks for sharing on TGIFF Jessica! Well, now that's versatile, when you consider that the patriotic holidays happen in the summer. You can just flip the runner for a few days every few weeks. Genius! Lovely; another example of how you can create something beautiful from small beginnings. 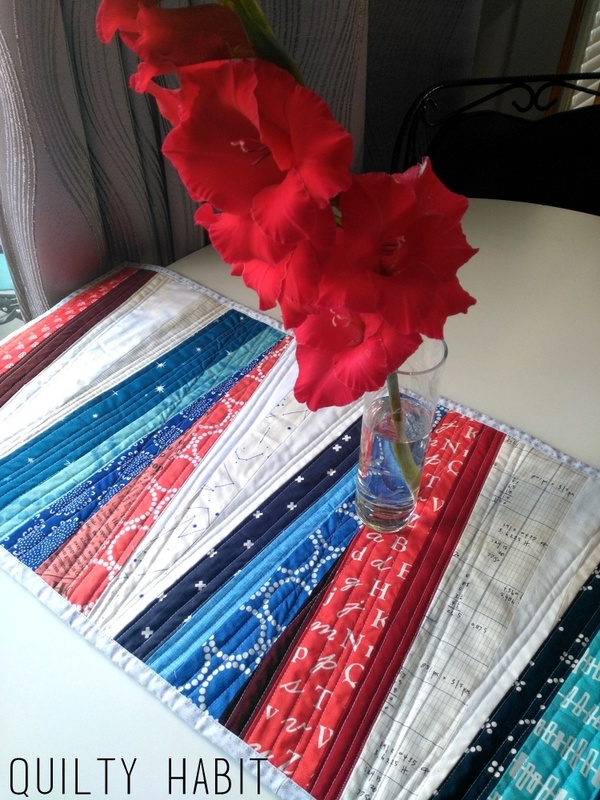 Practical too, making your table runner double sided. What a great idea with the two color options. While I like the patriotic, I love the brights! I can see why those fabrics have a special bin! Thanks for the pattern --when I'm ready to try a table runner this will be the one I start with. And I listened to the podcast--it was so much fun! 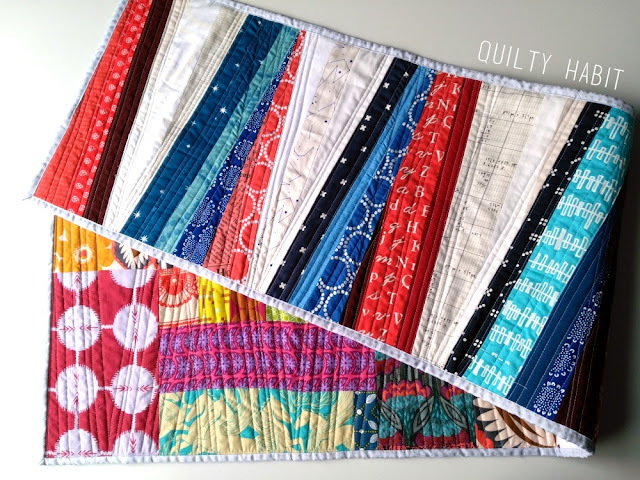 You did a great job--your enthusiasm for all things quilty was contagious. 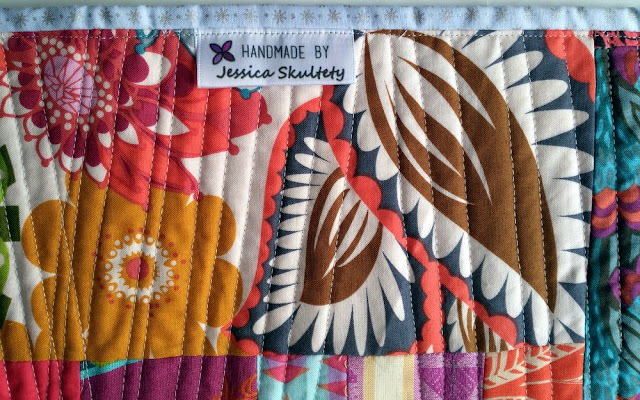 You are getting to be such a quilt celebrity! Looove that this table runner is SO you. 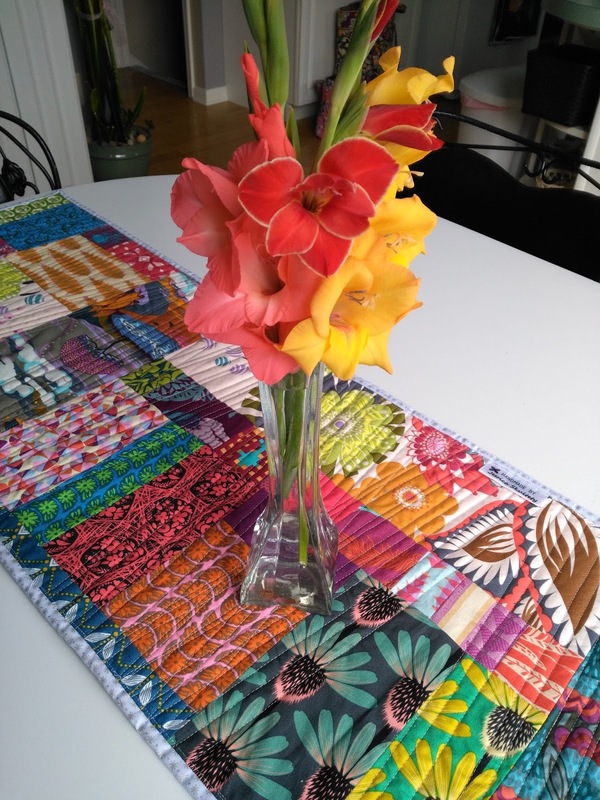 I totally need to make double sided table runners, they are multi seasonal and so fun.